Lentils are a food group belonging to the legume family. They grow in pods and are seeds that are edible. Lentils get their name from the Latin word lens, which means lens and refers to the shape of the lentil as it looks like a lens. The lentil can be categorized into color groups and the green and the brown lentils are part of these color groups. There are differences in taste, cooking time, usage in cuisine and health benefits. Lentils are found in the dried food section of the supermarket alongside other pulses and dried vegetables. The brown lentil is very popular and there are a number of different varieties of brown lentils. It is easy to tell the difference between the two varieties of lentil simply by their color. However, knowing the other differences is useful. Lentils can enhance different cooked foods or stand alone for health benefits. They are nutritious, inexpensive and easy to cook. Brown lentils are the most popular of the lentil groups. In addition to simply buying brown lentils it is possible to find Spanish Brown, German Brown or Indian Brown lentils. The tiniest brown lentil variety is the Bulga lentil. This variety is almost black in color, a very tiny lentil that actually looks like Bulga caviar when cooked, this is how it got its name. Brown lentils have an earthy flavor and take about twenty to thirty minutes to cook. They do not need to be pre-soaked like other pulses and are useful in soups and salads. It is wise to rinse the lentils before cooking to clean them and remove small stones that may be present. Brown lentils are very healthy and a great source of fiber. One cup of lentils yields 16 grams of fiber. They contain calcium, phosphorus ,iron, and vitamin B. Lentils have a low fat and sodium content. Brown lentils are inexpensive and also provide a good source of folate which together with fiber and potassium helps keep the heart healthy. Brown lentils are a good source of nutrients for weight loss because of their low calorie content and the high fiber aspect of their content. What culinary and dietary features are attributed to brown lentils? Brown lentils cook quickly and are a healthy food source. They have a number of minerals and vitamins in their dietary composition including a low fat content and low sodium count. One cup of lentils is equal to two hundred and thirty calories. Brown lentils can be enjoyed in soups and salads and eaten on their own. Brown lentils can be bought canned or dried. They can be flavored to be enjoyed as a stand alone dish using onion, cloves or herbs. Added to other dishes they enhance the flavor of the food. Brown lentils have more potassium content than bananas. The banana is known for its high potassium levels but, ¾ cup of lentils provides more potassium than a large banana. Brown lentils also contain copper, manganese, iron, protein, vitamin B1, pantothenic acid, zinc, and vitamin B6. These lentils contribute to a feeling of fullness after a meal and this was reported to be a positive outcome for weight loss. Green lentils are another variety of lentil but because of its harder outer skin it takes longer to cook. It has a more peppery flavor and it stays intact for longer. There are not as many varieties of green lentil compared to the brown lentils. The puy lentil from France is a lot more expensive than other varieties of lentils. The green lentil provides all the minerals and vitamins found in the brown lentil but the protein content of the green lentil is higher. This lentil is suited to being added to other dishes as it retains its shape and withstands longer cooking times. Green lentils also contribute to a healthy life style and are a good addition to soups and salads too. What culinary and dietary features are attributed to green lentils? Green lentils are a good source of fiber but have a high protein content as well. Green lentils retain their shape better than brown lentils and are therefor a better option in dishes needing longer cooking times. 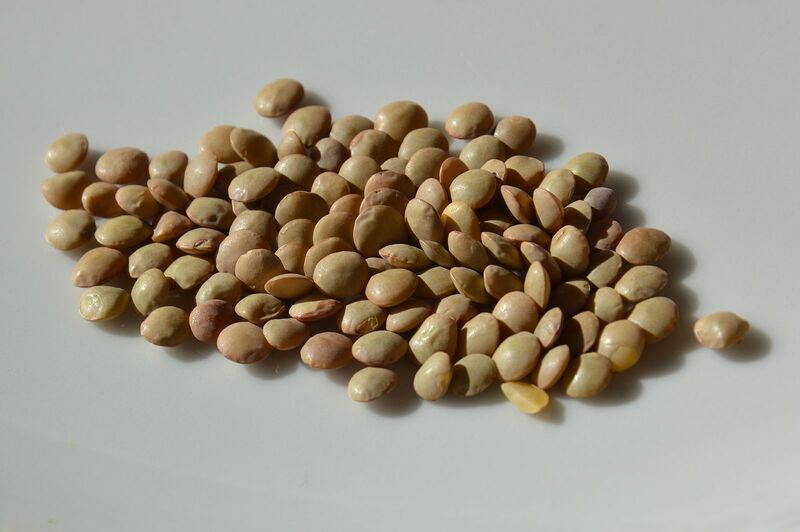 The green lentils has all the vitamins and minerals that are found in the brown lentil. 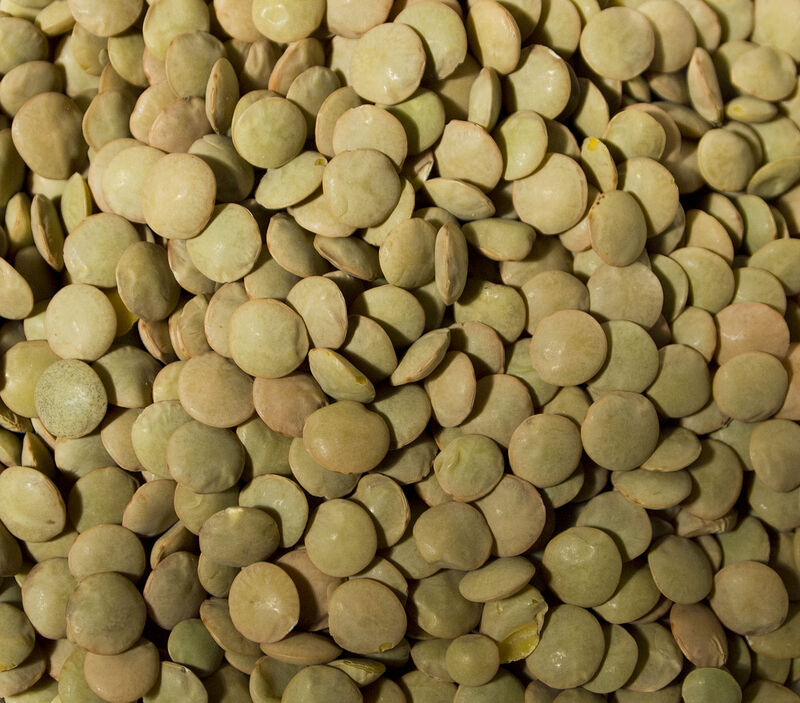 Green lentils are a dried food found in the dried vegetables and pulses section of the supermarket and they have a shelf life of up to a year. Both the green and the brown lentil have a high list of nutritional values including vitamins, minerals and fiber. The main difference is the green lentil has higher protein content while the brown lentil shows a higher fiber content. Lentils are a great addition to the kitchen pantry. They keep well as a dried vegetable and cook easily. Green lentils take slightly longer to cook than brown ones because they have a harder exterior but they will old their shape better. Brown lentils are softer and can be mashed. Both varieties add flavor to soups and salads and will stand alone if necessary with some flavor as their own vegetable dish. Lentils are very healthy because of their high folate and fiber qualities. Fiber and folate help with heart health. Lentils are low in calories and sodium and this makes them a healthy option on any diet. Both brown and green lentils are known as healthy options because of all the vitamins and minerals they provide. Lentils are suited to soups and salads but the green lentil has a slightly different flavor as it tastes peppery while the brown lentil has an earthy flavor. The green lentil is better suited to stews or dishes with longer cooking times because it holds its shape better. Lentils are legumes and stored as dried vegetables. They have a good shelf life of up to a year if stored in sealed containers. They don’t need soaking before cooking and if a really quick batch of cooked lentils is required then they will cook successfully in a pressure cooker for one minute. Lentils are a great asset to the average pantry because they are inexpensive and easy to store. They are both very nutritious and especially good for heart health due to the fiber and folate content. The fiber in the brown lentil helps with healthy digestion and the green lentil is a good protein source. Lentils do not require elaborate preparation or cooking methods. They can stand alone or be added to various soups and salads. The green lentil does well in dishes that require more cooking as they retain their shape better. The low calorie count for lentils make them a good weight loss option and the high fiber content means they keep hunger at bay as they give a full feeling for longer. Lentils are a good food source for vegetarians and vegans because of their high protein content. Around 26% of lentils calories are counted as proteins. The increased iron content of the lentils help to transport oxygen through the blood and this increases energy and the metabolic rate too. The low cholesterol value attributed to lentils lowers heart disease and lessens the possibility of having a stroke. Their folate and magnesium content help to improve blood flow and prevent heart disease. The humble lentil is undoubtably underestimated in its contribution to healthy eating and keeping a healthy lifestyle. Christina Wither. "Difference Between Brown Lentils and Green Lentils." DifferenceBetween.net. 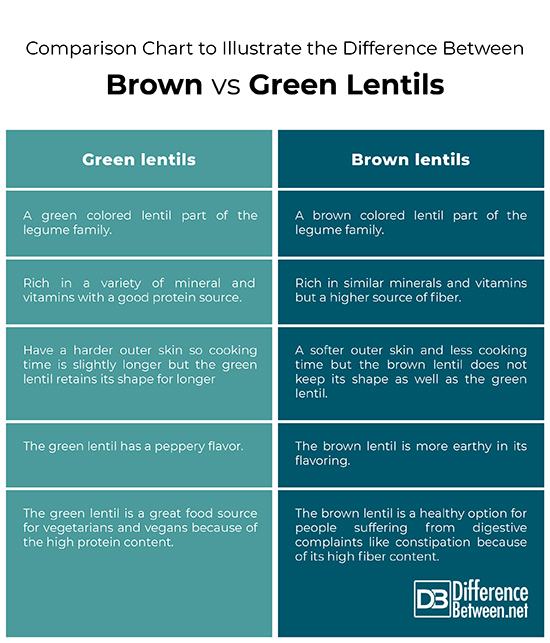 April 1, 2019 < http://www.differencebetween.net/object/comparisons-of-food-items/difference-between-brown-lentils-and-green-lentils/ >. Wise Victoria Dec 7th 2018. Brown or green lentils. www.cookstr.com.Modified diet-basic-brown-or-green-lentils. Pub Prime pub. LLC reviewed 16th Feb. 2019. Adams Moira. Oct 2014. Brown and Green lentils. Www.vegworld.com.brown-or-green-lentils.Pub. Prime pub LLC. Reviewed 16.02.2019.